You forgot to download IDrive	. Click the link below to download it. iDrive bundles together two great bits of functionality: data backup and seamless access to your data. You never know when something wrong could happen and that is why it is very important to keep your important files backed up. It is also very important to have easy access to all your data. Both these things are put at your disposal by iDrive: you can back up your data to the cloud and have seamless access to it. iDrive is available for multiple platforms: Windows, Mac, iOS, Android, and the web. This means that you can use iDrive on a PC, a Mac, an iPhone, an Android-powered smartphone, or directly from within your browser. The system requirements for running iDrive on a PC are as follows: 512MB of RAM memory or more, 10MB of free disk space for the installed program, 20MB of free disk space for local caching, Windows operating system (anything from 2000 up to 8), admin privileges for installing and using the application. To start using iDrive you must log in first. The nice thing is that you can easily sign up for an iDrive account and get 5GB of cloud storage space for free. Another nice thing is that you won’t have any problems figuring out the interface. You can access the backup, restore, schedule, and log from the panel to the right. And you can access the Preferences menu from the menu in the upper right hand corner. Using iDrive is a very straightforward matter. Select the files and folders you want to back up, hit the Backup Now button, and they will be uploaded to the cloud. Or better yet, set up a scheduler and instead of doing things manually, let iDrive do things automatically. If anything bad were to happen, you can easily access all the data you backed up and quickly restore it. iDrive allows you to securely, efficiently, and easily back up all the data you want. It also allows you to access and restore said data with the greatest of ease. iDrive is available for multiple platforms; the system requirements for Windows are very low. You will immediately feel at home with the iDrive interface. iDrive integrates with the right click context menu. 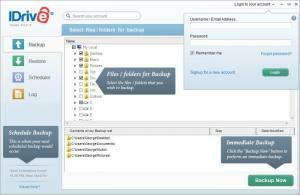 Use iDrive to upload/back up files to the cloud, easily access files from the cloud, and easily restore files. You can get started with a free 5GB account. You can download IDrive free here.